Castings are regularly necessary to have holes, recess, etc. of different sizes and shapes. This imitation can be getting by using cores. So where coring is necessary, if should be prepared to hold the core inside mold cavity. Core prints use to provide this function. Core print is adding projection on pattern and it forms a seat in mold on which sand core rests through pour of mold. Core prints have to be of sufficient size and shape so that it can hold weight of core during casting process. Depending upon requirement a core can located horizontal, vertical and can be hang in mold cavity. A core is a pre-determined shaped mass of dry sand, which is made separately from mould. It is positioned in a mould to obtain a shape in the casting which can’t be readily obtained by the mould properly. Core box pattern equipment, baking equipment and handling facilities are required for making of cores. Core can be eliminated when of small size particularly, if the hole is to be machined. Cores should be of sufficient thickness and free of fragile or overhanging projections, which might be easily broken during the necessary handling and transportation involved in production. The main material of the core is refractory, either a natural or a synthetic sand. The sand-mix used for core making consists of the sand together with a binder which is used to give strength after baking. A natural binder (sometimes called core-gum) is linseed oil. A synthetic binder is a synthetic resin. A recent development is to mix sand with sodium silicate solution so that the grains are coated and obtain the necessary hardness by ‘gassing’ with carbon dioxide, causing the sodium silicate to bond the grains together and produce strong core, thus eliminating the baking process. Since pure sand used for preparing core has no natural bond, binder is used. A core binder is an agent added to sand to produce a good ‘green’ bond and also hardness after baking. A typical natural binder is linseed oil; a typical synthetic binder is a resin of the thermosetting type. Generally, core oils (composed of 50 to 60% linseed oil, 25% resin and balance mineral oil) are used as they are very economical to produce better cores. In the case of thermoplastic binders (resin and pitch), the powdered binder is mixed with core sand, and on heating the binder liquefies and coats the sand grains. On cooling, the dispersed liquid binds the sand grains together to form a united mass. Use of synthetic resins is limited as they are costly. Addition of resin to core oil speeds up drying of core and reduces the volume of core gas. Pitch compounded with dextrin and steam coal is used for large cores. Phenol and urea formaldehyde thermo setting plastic core binders are becoming common due to their high strength, low gas formation, collapsibility and resistance to moisture absorption. Molasses adds hardness to the core but lacks in strength. On the core, molasses water may also be sprayed. Protein binders (gelatine, glue, caserim etc.) are used where collapsibility is the main criterion. Excepting very small cores, these are internally reinforced with core wires or grids to help cores retain their shape while damp, for transportation and for strengthening purposes. Cores are generally made of green sand or dry sand. The green sand cores have relatively low strength being made of green sand, whereas dry sand cores are made of sand and special binders which develop strength when baked. These could also be classified according to their position or use, according to which these can be of horizontal, vertical, balanced, drop and other types. These four types will be clear from Fig. 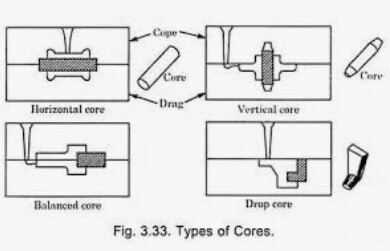 Horizontal and vertical cores are used more frequently than other types. In the case of balanced core, the core print should be sufficiently large to support the weight of core, which extends into mould cavity from one side only. It should be able to withstand the force of buoyancy of the molten metal surrounding it. Cores are made separately in a core box made of wood or metal. The various steps in core making are ramming of core sand in the box, venting, reinforcing, removing of core from box, baking, pasting, sizing etc. This work of producing cores can either be done by hand or by some machines designed for this purpose. In machine moulding, the core sand mixture is rammed by jolting, squeezing or blowing by means of suitable machine. Venting, reinforcing and other operations are carried out by hand. Cores of symmetrical cross-section can be produced by extruding core sand mixture through a suitable die opening. The cores by extrusion process are made in lengths and cut to shorter length as needed. Cores are generally made by core blowing machine for production work, in which the core sand is placed in small hopper over the clamped core box and blown under a pressure of 5 to 8 kgf/cm2. The core boxes are of special construction to provide for escapement of air. It requires special drying equipment. Even complex cores can be produced in a few seconds by core blowing method. Core boxes used for core-making are designed in several types which aid in core removal. The most commonly used are of split, rollover and hooked type. Generally baking is carried out in ovens equipped with drawers, shelves or other holding devices. The operation is generally continuous and cores are put either in batches or continuously over moving shelves. The heat in oven is produced by burning oil or coke or by electric resistance. Core-baking time depends upon the type and quantity of binder used, the amount of moisture used in sand, and size of core. The temperature for baking depends on the core material used. When cores are baked, they are more easily supported on a flat surface, which should be incorporated in the design. Dressing of cores is the operation of applying a compound to the surface of a core, either in the green state or after baking, for the purpose of providing protection against the scouring action of flowing molten metal and to assist the formation of a smooth surface in a cored hole or cored form. A core chaplet is a metal location piece inserted in a mould either to prevent a core shifting its position or to give extra support to a core. The molten metal melts the chaplet, which then forms part of the cast material. A core is supposed to be more per­meable than the mould itself and for this reason, coarse sand with large grain size (special washed silicon sand free from clay) mixed with molasses is used for core making. Vents are also provided in core for giving easy escape of hot gases that are generated during casting. Core should produce minimum amount of gas when in contact with molten metal. A core should be capable of collaps­ing shortly after the molten metal has solidified around the core. Collapsibility provides freeness in the contraction of the metal. According to service conditions to which a core is subjected, core sand should be highly re­fractory, and able to withstand high temperatures of mol­ten metal otherwise defects like rough surface and metal penetration etc. may occur. Core must have high strength and be capable of being handled after drying. If required, wires may be in­serted in the core while it is being moulded to give added strength. It must be able to withstand force of molten metal. To obtain the desired cavities and recesses, which otherwise could not be obtained by normal moulding operation. In pit moulding, the entire mould is made of cores. Sometimes the cores are also used to reduce metal erosion in gates and runners (splash cores), to retard foreign matter in the melt (strainer cores), provide a cup or basin on the top of mould (pouring basin cores).